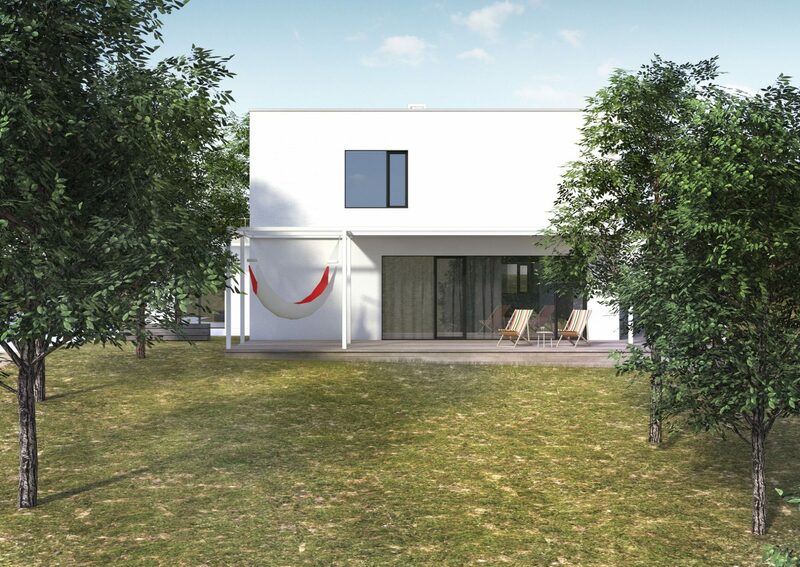 House on the Hillside – When designing this family house, we were inspired by the shapes and proportions of Functionalist and Modernist family houses. The area of the house is divided into individual floors where each floor is single-level in its area. Despite the use of elements of local architecture, our design of a family house does not lose the character of a 21st century building. We associate classical and contemporary materials and morphology in various forms and relationships. 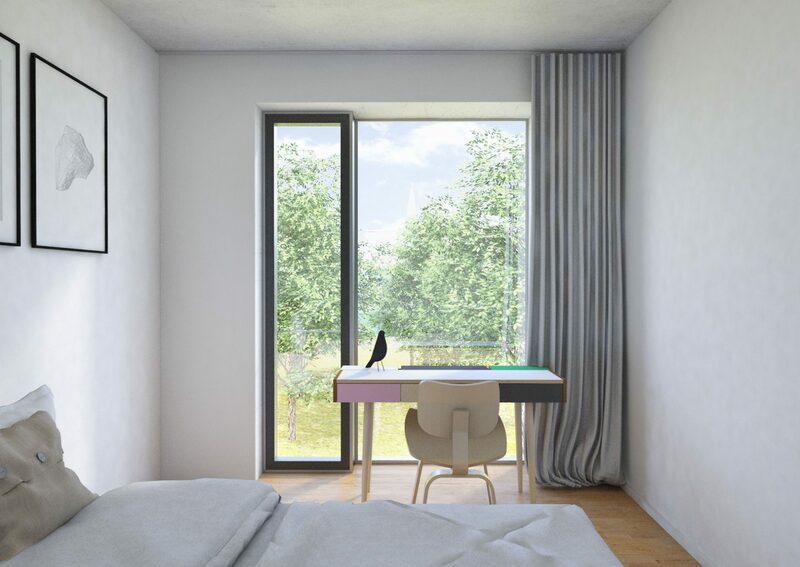 An important aspect of the design is the location of the family house on the land and respecting the beautiful view of the historic town of Kladno. The main entrance is oriented to the west, the entire house opens to the southern slope and along the eastern facade overlooking the city. Service areas are oriented north. The house is multi-storey with a large covered terrace facing south into the garden with landscaping. Entrance spaces, studio apartment, kitchen with pantry and living area with reading room are located on the first floor. The first and second above-ground floors interconnect the semi-open staircase with the recessed handrail. It is a combination of materials and it is illuminated by a roof skylight. The second floor is a private zone. From the staircase and the common generous hall space, we enter into individual children’s rooms, bedrooms, a wardrobe and a spacious bathroom with a sauna. The building’s material is distinguished on the first and second above-ground floors in the texture and grooving of the plaster. The studio apartment has a green roof. 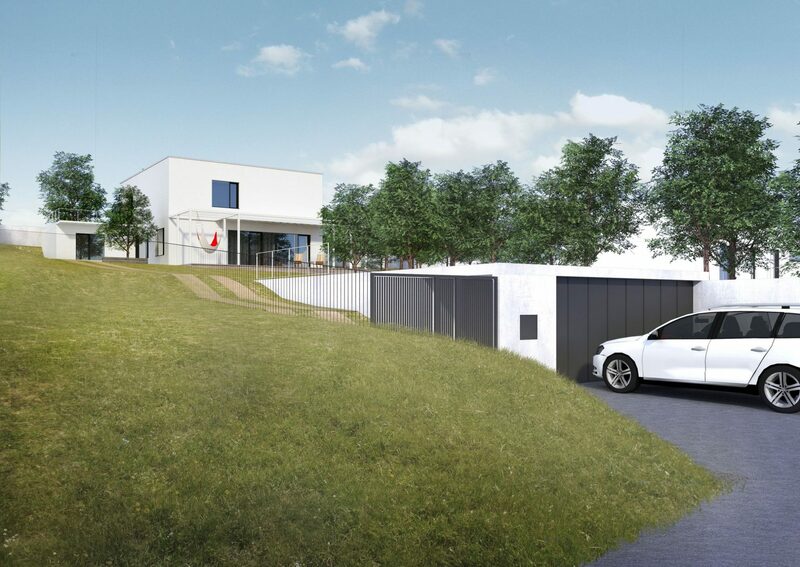 Garage with storage space is located outside the mass of the house, it is embedded in the slope at the level of the road, when entering the land. Again, there is a green roof element.